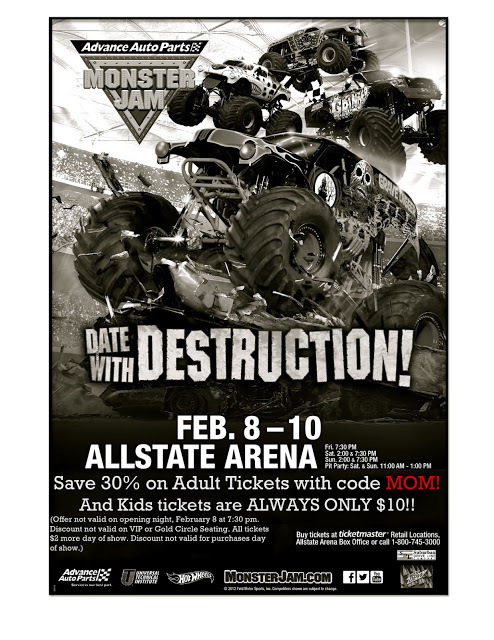 Advance Auto Parts Monster Jam 2012--opening night at Allstate Arena in Chicago. Like the music? It's Red Fang's tune, Dirt Wizard. Check 'em out. Check out our past coverage here, including original photo filled Monster Jam features. Our readers get 30% off advanced adult tickets with the code MOM. Body – Made of_____________, a monster truck body is custom designed to create a character or theme for the truck. Driver Seat – Most monster trucks have the driver seated ______________the vehicle so he or she can best see the track for weight distribution. As a safety measure, all seat belts employ ________________ to restrain the driver’s body. 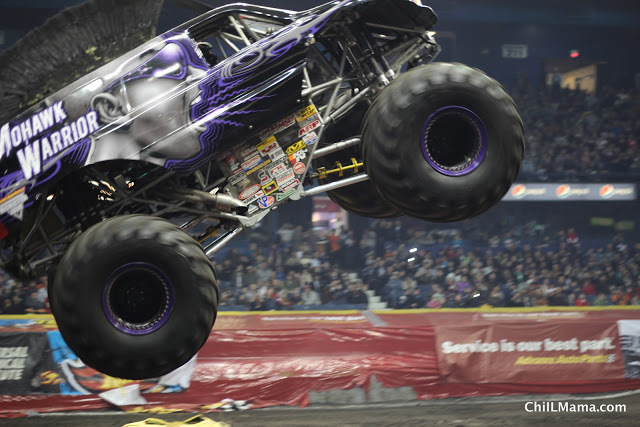 Paint – Most Monster Jam® monster trucks require _______________ of paint time. Engines – Custom-built, supercharged and methanol-injected, a monster truck engine burns up to _________________ of methanol per run (approximately 80 meters) and delivers about __________________. Suspension System – In order to allow the drivers to withstand the punishing impacts of jumping and crashing a monster truck during a performance, each Monster Jam monster truck is equipped with specially-engineered extra long 76cm shock absorbers filled with oil and ________________________ that are installed with each tire. Each monster truck tire is custom made but must be ______________ inches high and _____________ inches wide. The average monster truck team will go through _____________ tires in one year. The World Finals in ____________________ brings 24 of the top trucks in the world to compete for the World Freestyle and Racing Championships. Competitors are by invitation only. A monster truck race team will travel _______________ Miles a year by land to attend events. Typical monster trucks cost ___________________ yearly to build, staff, compete, transport and maintain on the Monster Jam tour. Average number of cars crushed per year: _____________________.